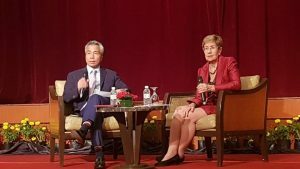 Managing Partner, Loong Caesar recently moderated a presentation by Justice Margaret Beazley, President of the New South Wales Court of Appeal in Kuala Lumpur. 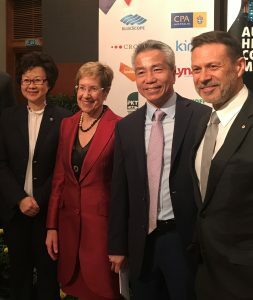 The talk organised by the Australian High Commission and the Malaysia-Australia Business Council (MABC) was an adjunct to the International Malaysian Law Conference 2018 and attended by members of the MABC and other invited guests amongst whom were Malaysian judges and practitioners. Justice Beazley spoke about the Australian experience of having an independent Director of Public Prosecutions, an office that was first established by statute in Victoria in 1982 although the first independent prosecutorial service was created some 9 years earlier in Tasmania. The Victorian Director of Public Prosecutions Act soon became the model adopted by all other states in Australia. Justice Beazley stated that the Victorian measure was in large part prompted by a desire to take politics out of the prosecution process. Her observations have a familiar resonance for Malaysians who have seen how prosecutorial discretion vested in its Attorney General resulted in the absence of action being taken against the country’s former Prime Minister, notwithstanding that he had become embroiled in massive kleptocracy allegations here as well as abroad. Institutional and legislative reform will be required to bring about a separation of the roles of legal adviser and public prosecutor, an objective that the current Attorney General has publicly announced as one of his priorities. That said, an independent public prosecution office is not without difficulty as Justice Beazley was wont to remind her audience. It was pointed out that the question of superintendence of public prosecutions by the Attorney General was still a matter of debate even in advanced economies. Disagreement continues over the issue of oversight of prosecutorial discretion and its limits. If the Attorney General should retain a measure of prosecutorial discretion, then in what respect should that discretion be exercisable? And if the Attorney General has authority to give directives relating to prosecution, then should those directives be in terms of a general policy or should there be power to give formal directives in individual cases? Furthermore, Justice Beazley suggested that as long as the position of Attorney General was a political one, accountability of the Attorney General to the wider electorate could not be completely removed, and this would mean that a degree of intervention into prosecution discretion would be necessary. Her insights will be of great interest and value to Malaysia’s new government as it attempts to accommodate the desire of its supporters for change in this respect and how far it should go towards reforming the public prosecution services of Malaysia.